Pulmonary veno-occlusive disease (PVOD) is a disorder which causes progressive pulmonary hypertension, usually presenting with worsening dyspnoea and right heart failure. Pulmonary oedema induced by pulmonary vasodilator therapy to reduce pulmonary arterial pressure has been well described in PVOD, but here we describe a case of PVOD presenting with recurrent episodes of acute non-cardiogenic pulmonary oedema, in the absence of significant pulmonary hypertension. Concern over the risk of precipitating pulmonary oedema led us to use inhaled nitric oxide to predict the safety and efficacy of sildenafil. Pulmonary veno-occlusive disease (PVOD) usually presents with worsening dyspnoea and right heart failure as a result of pulmonary arterial hypertension (PAH). Here we describe a case of PVOD presenting with recurrent episodes of acute non-cardiogenic pulmonary oedema with only a borderline increase in pulmonary artery pressure, confounding the diagnosis until surgical lung biopsy was performed. In view of the risk of precipitating pulmonary oedema with vasodilator therapy, we also report on the use of inhaled nitric oxide to predict the safety and efficacy of sildenafil. A previously healthy 21-year-old Afro-Caribbean male presented with a 2 h history of breathlessness. There was no associated chest pain, cough, wheeze or fever. He was apyrexial and had a saturation of 90% on high flow oxygen. He was tachycardic in sinus rhythm with a blood pressure of 110/70 mm Hg. He had widespread inspiratory crackles. His chest radiograph is shown in fig 1A. Routine blood tests revealed neutrophilia with a C reactive protein level of 4 mg/l. He started on continuous positive airway pressure (CPAP) and was treated for pneumonia with intravenous cefuroxime and clarithromycin. Pending results of an HIV test (subsequently negative), he received septrin and prednisolone for 2 days. Microbiological investigations for pneumonia were negative. Rheumatoid factor, sickle solubility test, serum ACE and autoantibodies were also negative. Figure 1 (A) Chest radiograph of the patient. (B) CT scan of the chest. He improved rapidly over 2 days, with complete resolution of radiographic changes, but remained persistently hypoxaemic with exertional breathlessness and desaturation (from 93% to 76%). A CT excluded a pulmonary embolus and indirect evidence of PAH, such as dilated pulmonary arteries or right-sided cardiac chambers. There was no septal thickening, but extensive mediastinal and hilar lymphadenopathy and peripheral lung attenuation (fig 1B). Lung function showed normal lung volumes with severely impaired gas transfer (carbon monoxide transfer factor 5.09 mmol/min/kPa (43%), KCO 1.0 mmol/min/kPa/l (59%)). Given these findings and because of the rapid response presumed secondary to steroids, he was restarted on oral prednisolone 40 mg, with a presumptive diagnosis of sarcoidosis. Following discharge he was readmitted twice in quick succession with similar clinical and radiographic findings, responding rapidly to CPAP. On both occasions he had also reported streaky haemoptysis and frothy sputum. Transbronchial biopsy was inconclusive. 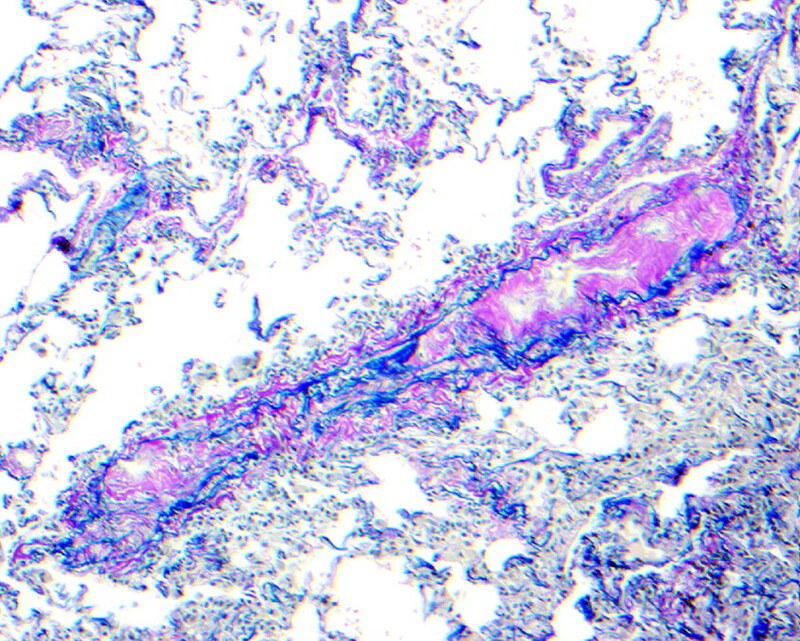 Thoracoscopic lung biopsy showed patchy capillary congestion within the alveolar parenchyma and marked intimal changes in veins and venules, the features characteristic of PVOD (fig 2). He was transferred in to the National Pulmonary Hypertension Service, where echocardiography showed a mildly dilated right ventricle (RV) with moderately impaired systolic function. Estimated RV systolic pressure was 41 mm Hg. Left-sided cardiac chambers were normal. Subsequent cardiac MRI showed a structurally normal heart. Cardiac catheterisation demonstrated borderline elevation of mean pulmonary artery pressure (26 mm Hg), with normal mean wedge pressure (7 mm Hg) and left ventricular end diastolic pressure (8 mm Hg), cardiac index of 4.5 l/min/m2 and pulmonary vascular resistance of 160 dyn×s/cm5. He was anticoagulated, treated with low dose diuretic and referred for lung transplantation, which he declined. Figure 2 Thoracoscopic lung biopsy, showing patchy capillary congestion within the alveolar parenchyma and marked intimal changes in veins and venules. He was stable for 6 months, and only on routine follow-up admitted worsening WHO functional class IV symptoms over the past month. He was severely hypoxaemic (Pao2 5.4 kPa on 40% oxygen): a chest radiograph and high resolution CT showed little change. An echocardiogram showed severely impaired RV systolic function with an estimated RV systolic pressure of 82 mm Hg and normal left ventricular function. He was given a trial of inhaled nitric oxide (NO) at 40 ppm in intensive care: his saturations increased from 93% on 40% oxygen to 99% on air. He was therefore started on oral sildenafil 50 mg three times daily and improved to WHO functional class III with saturations of 96% on 35% oxygen. Three months later he deteriorated further (again with no evidence of pulmonary oedema). Sildenafil was up-titrated to 100 mg three times daily and intravenous epoprostenol added. At a dose of 20 ng/kg/min he developed radiological signs of pulmonary oedema, which resolved when reduced to 18 ng/kg/min. He remained in severe right heart failure and was discharged home with palliative care, where he died a week later. PVOD is a rare and incompletely understood cause of PAH with a grave prognosis. 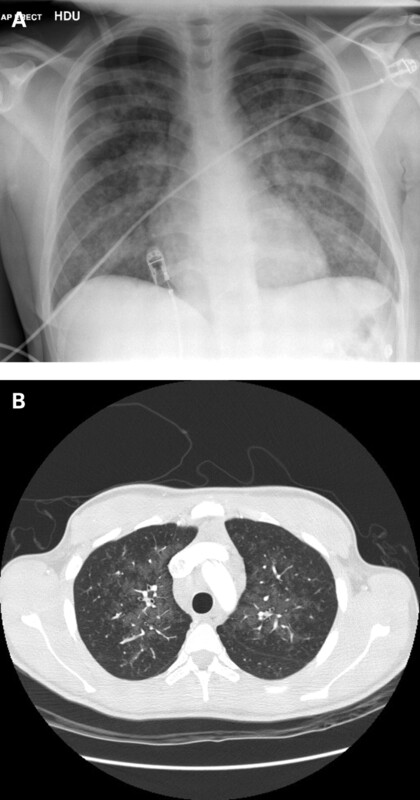 Lung transplantation is the only curative option, without which mortality is 72% at 1 year.1 Presentation is usually similar to PAH with progressive dyspnoea and pulmonary hypertension, but may be acute, even presenting with sudden death.2 The characteristic radiographic appearances are interlobular septal thickening, ground glass shadowing and mediastinal lymphadenopathy. The cause of PVOD remains unclear, although associations with multiple conditions have been reported.1 The characteristic progressive and patchy narrowing and occlusion of the small postcapillary pulmonary veins causes heterogeneous areas of increased pulmonary capillary pressure, ultimately leading to pulmonary hypertension and oedema. This is in contrast with another cause of non-cardiogenic pulmonary oedema, high altitude pulmonary oedema, which induces pulmonary oedema and hypertension through exaggerated heterogeneous pulmonary arterial vasoconstriction3 (in response to hypoxia). The unusual feature of our case was recurrent acute pulmonary oedema and the absence of significant pulmonary hypertension, although catheterisation was performed when the patient was stable. Interestingly, he later developed pulmonary hypertension, but without the classical radiographic features of PVOD. Treatment of PVOD with pulmonary vasodilators, such as prostacyclin, is controversial as it may precipitate life threatening pulmonary oedema due to the presence of venous obstruction.4 There is a suggestion that sildenafil, which augments the NO signalling pathway by inhibiting phosphodiesterase dependent breakdown of cGMP, may have a better safety profile due to potential venodilator properties.5 We chose therefore to use NO to predict the short term response to sildenafil, because of its short half life. Despite initial improvement, he developed progressive pulmonary hypertension, and cautious introduction of epoprostenol unfortunately produced pulmonary oedema at a moderate dose. This case documents that PVOD may present with recurrent acute episodes of pulmonary oedema, even in the absence of pulmonary hypertension when stable. Where there is concern over the precipitation of pulmonary oedema with vasodilator therapy used to treat pulmonary hypertension, inhaled NO may be useful to predict the response to sildenafil. The authors thank Dr Paula Johnson, Dr A Mahar and Dr James Jackson.
. Pulmonary veno-occlusive disease: a case series and new observations. Chest 2000;118:1671–9.
. Pulmonary veno-occlusive disease and pulmonary capillary hemangiomatosis: a clinicopathologic study of 35 cases. Am J Surg Pathol 2006;30:850–7.
. Heterogeneous pulmonary blood flow in response to hypoxia: a risk factor for high altitude pulmonary edema? Respir Physiol Neurobiol 2006;151:217–28.
. Massive pulmonary edema and death after prostacyclin infusion in a patient with pulmonary veno-occlusive disease. Chest 1998;113:237–40.
. One-year follow-up of the effects of sildenafil on pulmonary arterial hypertension and veno-occlusive disease. Braz J Med Biol Res 2005;38:185–95. Patient consent: Obtained from the patient's next of kin. Thorax 2008; 63 i-i Published Online First: 26 Sep 2008.